On Saturday night at 2am, I woke up to find my Fisher & Paykel Icon CPAP machine not working. The display on my F&P Icon+ was showing a 5.03 error code and wouldn’t restart at all. I jumped online straight away and did a quick search, nothing really about that error code. I decided to see if unplugging the machine at the wall and making it restart entirely would get it back up and operating so that I could get some sleep and investigate more thoroughly in the morning. That seemed to do the trick and when the machine powered up again I was able to press the button and the air started to flow. Before I even laid back down that I noticed the airflow didn’t sound right. Normally when you look down into the Icon CPAP machine you can see the humidifier well lit up and the air flowing through causing the water to agitate a bit. This time, while there was some air going through, the water was very still. I put the mask back on and hooked up to the hose and tried to go back to sleep. Immediately I could tell something was wrong with the air pressure – it just wasn’t powerful enough. As I laid there with the mask on I could hear the CPAP machine labouring to force air through the hose and my mask wasn’t really inflating correctly. I managed to go back to sleep after a few minutes, but unfortunately, I woke up again at 4:19am with the machine really struggling – it was making an awful noise, so I turned it off. I took the mask off and tried to go back to sleep naturally, but as I’ve come to discover, I actually find it odd sleeping without my CPAP mask now, so after about half an hour, I got up and out of bed at 4:45am. For the first time since going on CPAP over three months ago, I felt tired Sunday afternoon. I’d only gotten about 3 hours sleep and with the machine on the blink, it probably wasn’t even good sleep so I decided I’d try and have a nap that afternoon using the machine. I went through the whole pre-flight regiment of filling the container and getting everything ready just like I was going to sleep at night. The machine kicked in, sounded right and for the first time in three months, I had an afternoon nap. The nap lasted about an hour before it just didn’t sound right again and the air pressure was no good. I woke up and sent an email to Fisher & Paykel Healthcare support to ask what the 5.03 error code on the Icon+ was and I also sent my supplier an email telling them about the trouble. I managed to use it again on Sunday night and got about 6 hours sleep – the machine struggled at times. By 9:30am on Monday I’d had responses from both my supplier and Fisher & Paykel. The Fisher & Paykel support rep told me that the 5.03 error code on the Icon+ meant that there was a motor issue and that I should take it right away to my supplier to be assessed. My supplier told me that they’d do a straight replacement on the spot for me whenever I could bring it in. It was a very painless process – I literally went to the supplier’s office and they setup a brand new Icon+ for me, took a data dump off the old device and twenty minutes later I was back home in the car. One thing that we looked at was the data from the last week which has been very sporadic with my AHI fluctuating wildly, night to night and my leaks having increased by 50%. My supplier told me that he felt that the motor had probably been playing up for a week causing the air pressure to be irregular. It’ll be interesting to see if those numbers come down now with the new machine. I’d also like to add that this is the third time I’ve had reason to contact Fisher & Paykel support and each time, they have contacted me within 24 hours of my email and most importantly, they’ve replied with sensible, coherent answers to my questions. I’m very happy with them! Have you ever had a mechanical fault with your CPAP machine? I’d really like to hear what happened with your machine and what was the outcome? Please leave a message below and tell me about your experience. Glad I found this, I have had the 5.03 error code twice and the machine seems that it will not put out air any higher than 4.0cpm. I am calling today to report he issue. I am getting a 5.01 error. I tried to unplug and restart and it did start but is gurgling. i am getting a 5.02 code.what is this actually? I woke up this morning my machine had stopped running and had a 1.01error showing.I have turned it off at the power waited a while and turned it back on but still shows the 1.01 error.What can I do? 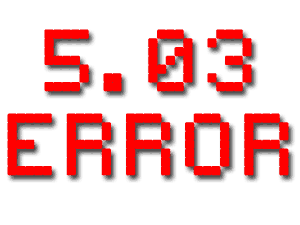 Any error code with the F&P Icon series CPAP Machines, from the 5.00 to 5.08 are all related to the motor. If you’re getting a 5.02 error and the machine isn’t starting then the only course of action is to take it back to the supplier for a service or replacement.